In World War II C-47s occasionally were used to drop bombs, usually when no bombers were available for the job. Twenty years later, during the Vietnam War, their C-130 successors also dropped bombs, but in a mission that was anything but a matter of expediency. The C-130 bombers of Project COMMANDO VAULT had a reputation for accuracy exceeding that of all other airplanes dropping bombs during the Vietnam War. The C-130 bombing mission came about more or less by accident. Sometime in 1968 Major Bob Archer's crew from the 29th Tactical Airlift Squadron carried two colonels, one Army and one Air Force, as passengers on their C-130B while on a routine mission. The crew got to talking to the two field grade officers, and they asked Archer's opinion of the C-130 as a bombing platform. Archer replied that he thought the Hercules would make an ideal bomber. The two officers told him they were in Vietnam to evaluate the use of left-over 10,000 pound bombs originally designed for the B-36 to clear "instant" helicopter landing zones for the Army. Plans at the time were to use Army CH-54 "Skycrane" helicopters to drop the bombs, but the C-130 was thought by many to be a more suitable vehicle. Tests had already been conducted at Kirtland AFB, New Mexico with a C-130. A single C-130 could carry two bombs and do it for less cost. By the time the flight ended, Major Archer had been asked to head-up a program to drop the huge bombs from C-130s. He returned to the United States to work on the project, then came back to his unit at Clark AB, Philippines. His crew made the first drops in South Vietnam in the fall of 1968 and plans were made for the 463rd Tactical Airlift Wing to begin regular missions in the spring of 1969. Converting the HERCULES to a bomber required only a few slight modifications, primarily the addition of radio reception capabilities to the loadmaster's interphone station in the cargo compartment. The C-130 loadmaster would actually release the load, an operation that gave them the distinction of being the only enlisted men in the Air Force to release an aerial weapon. 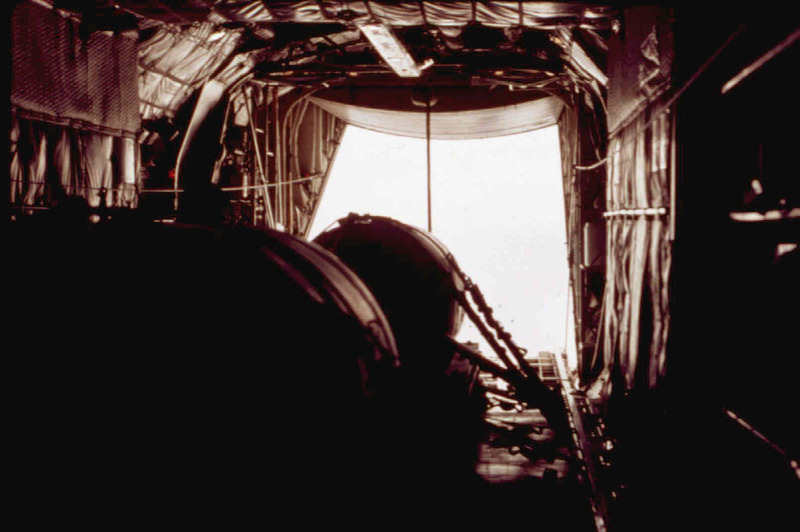 The bombs were delivered using modified heavy drop techniques, with a ground radar operater in an MSQ-77 radar site providing guidance to the crew to position the airplane over the release point. Drops were begun in the spring of 1969, with instructor crews from each of the four squadrons of the 463rd wing - the 29th, 772nd, 773rd and 774th - qualifying for the mission after a checkout by Arher's crew. The initial crews trained other crews in turn. The checkout consisted of flying a couple of missions with a qualified instructor crew and since the aerial delivery portion was nearly identical to heavy equipment drops with certain exceptions, the only additional training required was for the pilots and navigators to work with the MSQ-77 controllers and for the loadmaster to learn how to set up the extraction system. Though the bombs were used primarily to create helicopter LZs, the targets were sometimes right on top of enemy base camps! My first bomb resulted in a Bomb Damage Assessment of an estimated 100 enemy KIA! 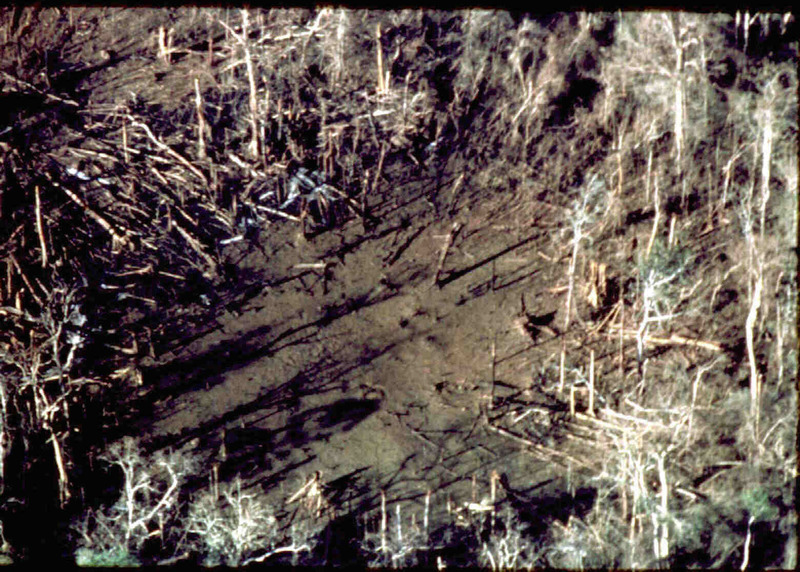 Not only did the landing zones created by the bombs provide clearings in the jungle where none had existed, they were also safe for the troops who used them since everything within a mile of the blast was temporarily incapacitated by the explosion while anything in the immediate blast area was killed outright. Bombs were dropped for both the Army and the United States Marines. By early 1970 the supply of M-121 10,000 pound bombs was beginning to dwindle, while at the same time their age often led to duds. And a dud bomb had to be detonated to keep the supply of TNT from falling into enemy hands. The resourcesful North Vietnamese would turn the TNT into mines and sachel charges. In response to the Army's request, the Air Force created the more powerful Blu-82, a 15,000 pound bomb containing a slurry mixture made of an aluminum-derived explosion called CX. (Because the bombs looked like propane tanks, a rumor spread that the explosive was a mixture of TNT and propane, but this was not true.) The drop procedures were the same, and two bombs could still be carried aboard a C-130. The bombs were a smash with the Army and Marines, who began calling for the detonation of one or a pair to launch new operations in the jungles. When U.S. and South Vietnamese troops crossed the border into Cambodia in May, 1970 they assaulted into LZs that had just been created by the detonation of four of the weapons. Similar drops preceded the South Vietnamese invasion of Laos in early 1971. 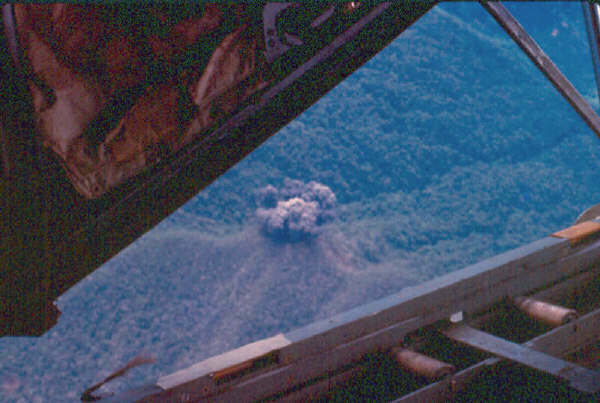 Blu-82s were dropped on Communist positions in Laos in support of the South Vietnamese troops. Because the delivery of the huge weapons required no modification to the C-130, a crew could drop two bombs in the morning, then spend the remainder of their crew duty day shuttling into a nearby forward airfield bringing in ammuntion and fuel or other supplies for the troops who were mounting the operation the bombs had just kicked off. COMMANDO VAULT demonstrated the versatility of the C-130 as they were bombers in the morning, and transports in the afternoon. The Commando Vault crews were the most highly qualified in the 463rd wing and once a mission had been completed, they were naturally assigned to the more demanding missions on a particular day for the duration of their crew day. When the 463rd was inactivated in 1971, the COMMANDO VAULT mission passed to the 374th wing at CCK Air Base on Taiwan. The 374th continued to drop the bombs until the end of American participation in the war in 1973. The South Vietnamese Air Force was provided with some Blu-82s during the final days of the war. USAF C-130s flew the rigged bombs to Tan Son Nhut where they were reloaded aboard South Vietnamese C-130As for delivery. A single bomb dropped near the town of Xuan Loc killed a reported 1,000 North Vietnamese troops. Additional BLU-82s were rushed to Clark AB and rigged by US riggers, then transported to Saigon in USAF C-130s. Unfortunately for South Vietnam, the huge bombs failed to prevent the North Vietnamese juggernaut that rolled toward Saigon. COMMANDO VAULT had some by-products in that the radar-guided deliveries led to similar techniques being developed for the delivery of cargo. 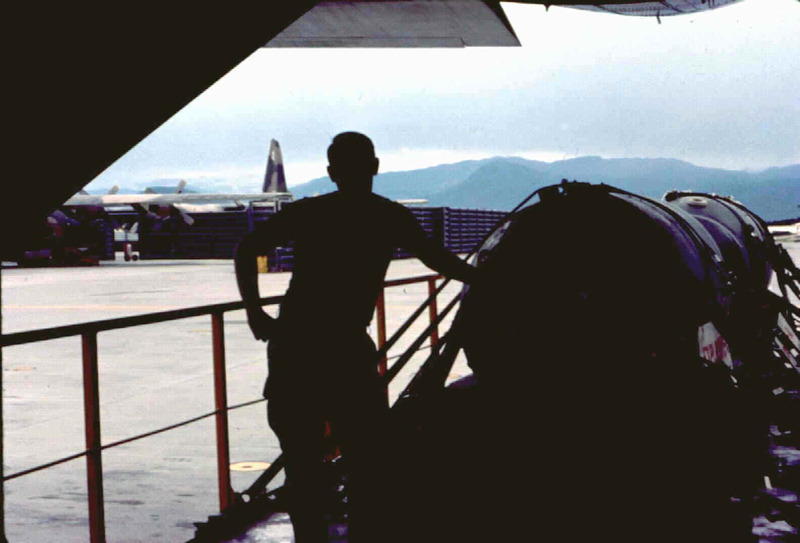 Test CDS missions using the same techniques used for the bombs and specially rigged high-altitude loads were flown by a 463rd Stan/Eval crew in late 1969 and early 1970. The intensity of the war in South Vietnam had begun to ebb as the US ground combat role declined and the need for CDS drops was dimishing so the new method was not used operationally at the time. The GRADS method proved to be a God-send during the siege of An Loc in the spring of 1972 however, as it allowed USAF C-130 crews to drop from altitudes above the range of the antiaircraft guns and SA-7 missiles that were being used by the North Vietnamese. Three USAF C-130s and several VNAF C-123s were shot down over An Loc before the C-130s went to the high altitude drop method. Dropping loads rigged by US Army riggers with special rigging techniques allowing high-velocity drops from high altitudes, the GRADS crews were able to achieve the same accuracy with cargo bundles that they were attaining with the bombs. And just now accurate were the bombers? 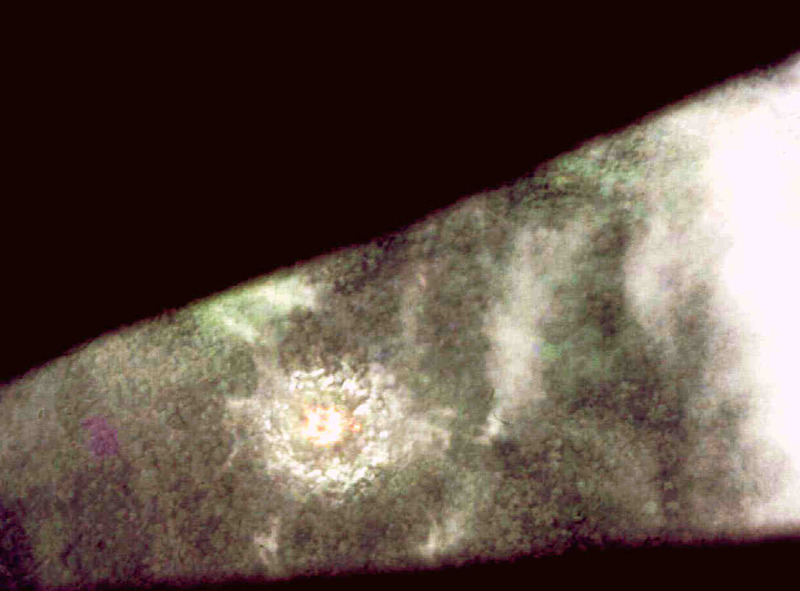 I have a slide in my files showing a M-121 exploding smack on the top of a mountain peak west of Da Nang! In 1969 SAC sent out a letter showing the average circular error of all aircraft dropping bombs in Vietnam using the ground radar method. The C-130s had the lowest circular error of all the types - including SAC's own B-52s! and to serve as a psychological weapon. The military recently developed and new and improved successor to the BLU82 called MOAB.